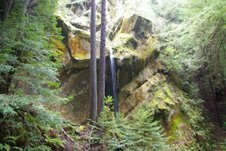 Hi June, I had the chance recently to hike up to a waterfall on a creek that feeds into Pescadero Creek. I’d been there years ago, but the water’s flowrate then was so puny it was not easy to capture it on photographs. With the winter rains we’ve had lately it was a different story this time. Besides the setting, the thing I was most impressed by was the fact it was a plunge waterfall. It’s plunge was about 50 feet, which is probably the highest I’ve seen on the Coastside. But, I’m a frequent visitor to the ocean, not the mountains, and know little about the hinterlands, except what I can easily access from the roads I use to go to the beach. I suspect this waterfall, on private property, doesn’t have a name, but I’ll check the free topo maps at my library to make sure. The hike got me to thinking about the different types of waterfalls I’ve seen through the years. If you’ve ever wondered how they are categorized, here is an excerpt from Wikipedia about waterfalls. 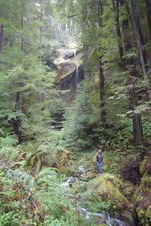 Purisima Falls for instance has “Cascade” features combined with “Fan” features. Block: Water descends from a relatively wide stream or river. Cascade: Water descends a series of rock steps. 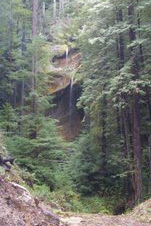 Cataract: A large, powerful waterfall. Fan: Water spreads horizontally as it descends while remaining in contact with bedrock. Horsetail: Descending water maintains some contact with bedrock. Plunge: Water descends vertically, losing contact with the bedrock surface. Punchbowl: Water descends in a constricted form and then spreads out in a wider pool. Segmented: Distinctly separate flows of water form as it descends. Tiered: Water drops in a series of distinct steps or falls. Multi-step: A series of waterfalls one after another of roughly the same size each with its own sunken plunge pool. 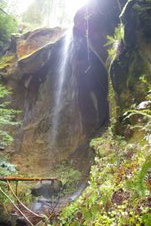 This entry was posted in Coastside Waterfalls, John Vonderlin and tagged John Vonderlin. Bookmark the permalink.